The hasty pullout came directly on the heels of Bolivian President Evo Morales’ Sept. 10 expulsion of the U. S. ambassador for allegedly inciting opposition protests. Arnstein was among disappointed volunteers who believe their government overreacted, hurting U. S. interests with the blanket withdrawal. True, some parts of Bolivia were dangerously unstable, but most volunteers felt no security threat, several of them told the Associated Press. 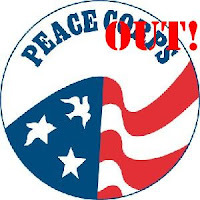 “Peace Corps, unfortunately, has become another weapon in the U. S. diplomatic arsenal,” said Sarah Nourse, 27, of Mechanicsville, Md., another volunteer who opted out. The top U. S. diplomat for Latin America, Thomas Shannon, told the Associated Press that security was the only reason behind the “saddening” pullout. “Remember, the Bolivians on at least two occasions that I’m aware of said that they thought the Peace Corps was part of a larger intelligence network that they thought we had constructed in Bolivia. Those kind of statements we find very worrisome,” Shannon said. In fact, a U. S. Embassy security officer suggested to a group of Peace Corps volunteers during a briefing last year that they report any sightings of Venezuelan or Cuban activists. After the incident was publicized, the embassy said the officer had not been authorized to make such a request and he left the country. Interestingly, noted at Democratic Underground, the Houston Chronicle decided not to publish the last two paragraphs (above) of the story. I wonder why? The hard truth is that if/when the Peace Corps return to Bolivia they will have these 70 volunteers to thank for standing up for the integrity of their projects above politics by staying in Bolivia. Remember that. Thanks for your comment on mine! So, did the volunteers quit in order to stay in Bolivia, or did they quit in protest at the decision and go home? Can't really tell. Good on them! I can't believe the hypocrisy coming out of Washington. The Peace Corps, fergawdsakes!!! What next? Will ordinary gringo travellers going to see and enjoy Evo's Bolivia be the next ones asked to either spy and report to the US embassy in Peru or flee there from angry Masista mobs that don't exist? check out the update, dude! As a PCV who just left Bolivia. I am bother how the press spun the story. If you read Sarah's blog you will see that is not what she intended out of the story. I think that the US and Bolivian govt share the responsibility. Evo and the opposition parties created an environment that was unsafe for volunteers. We were all saddend to leave Bolivia, it is an incredible place. Its just too bad that some people want to throw us and PC under the bus for their own agenda. I am glad to see you recongize that there are those willing to throw PC under the bus for the sake of their political agenda. So who are these people? Let's discuss. Who asked PC volunteers to spy for them? Who exaggerated threats to PC volunteers during a moment of political confrontation between the US and Bolivian governments? Who exploited these "threats" to leverage their political agenda? Who canceled the PC Bolivia program based on exaggerated threats? Whose intelligence services are currently monitoring PC volunteers' personal blogs? I'd ask you to look up a psychological condition known as "Stockholm syndrome". It is when a captive comes to irrationally love their capturers. Please check out Inca Kola News' blog if you do not believe the CIA is monitoring your blog as well, as I am fully aware they regularly monitor this blog. Just checked out your blog, Mike and Britt. Your comments are welcome (not that I presume to speak for El Dude), but I really don't think there were any conditions that made it unsafe for PCVs here in Bolivia. I think the U.S. wanted to make the folks back home hysterical, and the manipulation of the PC was one part of that plan. Throughout the crisis--which was real, and really dangerous, as events in Pando showed--I traveled extensively in the large towns (CBBA, SC, LP--admittedly not in the flash zones) and never had a problem. I even was in Plan 3,000 in SC before the violence in Pando, and had no problems (P3K is the Morales stronghold in SC where, because I'm from the States, I thought I might run into trouble). So I'm very skeptical about reports saying that there was a climate of danger for foreigners here. Crime is a problem, sure, but political violence? No. Not any that I've seen. (Speaking as a foreigner. Bolivians obviously have it much worse. Especially if you are an Indian.) And I've been out and about a lot throughout this situation. Anyway, sorry you guys got caught up in BushCo shenanigans. Also: That pic of you guys on the plane is incredible. It's like they were trying to turn it into something it wasn't by flying you out in a military plane, almost looks like you guys were under fire!